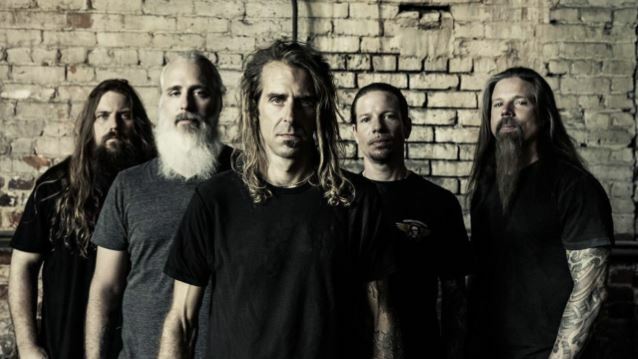 The official video for "Embers", a song from Richmond, Virginia-based metallers LAMB OF GOD, can be seen below. The track, which features a guest appearance by DEFTONES frontman Chino Moreno, is taken from the band's latest album, "VII: Sturm Und Drang", which was released in July 2015 via Epic in the U.S. and Nuclear Blast Entertainment in all territories outside of North America. The CD was once again produced and mixed by Josh Wilbur with engineering by Wilbur, Nick Rowe and Kyle McAulay, and was recorded at NRG Recording Studios in North Hollywood, California and Suburban Soul Studios in Torrance, California. LAMB OF GOD guitarist Mark Morton told Noisey about "Embers": "About 12 years ago, I began writing a song that I instantly knew was special. The sinewy, meandering, groove-laden riff… the open, expansive landscape chorus… the cycling, hypnotic lead hook… they all presented themselves to me in a way that we songwriters often hope for, but rarely get to experience. It felt somehow divine, or otherwise supernatural to feel the music and energy coalescing and choosing me as their medium. It was one of the most exciting, satisfying and elusive feelings I've ever known. "Knowing that I was on to something special musically, I began the task of penning lyrics to this new creation. Art was imitating life. I was very newly in love with a beautiful young woman who would eventually become my wife. I yearned to let her know how deeply I felt for her, painstakingly scribbling lyrics asking my love to 'take hold of my hand' and promising her she was 'never alone.' The song was called 'Walk With Me In Hell'. I must admit, at the time, I had absolutely no idea that my quasi-poetic notion of asking my new partner to 'walk with me in Hell,' meant that she soon would. "Four years later, my wife and I found ourselves in a small corner of a neonatal intensive care unit, holding and caressing our first born infant daughter. The ambient hum of medical machinery droned in the background and a panoramic window framing the Shenandoah Mountains sprawled out in front of my new family and I. We gazed lovingly over every detail of our daughter's face, every freckle on her skin, cataloging every sound and smell the way all new parents do. The difference was that our child had developed an infection during delivery. She was very, very sick and her prognosis hadn't yet been determined. Later that day, our daughter Madalyn Grace Morton died in my arms. We were walking through Hell. Life was imitating art. "Few would argue the fact that losing a child is one of the worst things anybody can go through. The effects an individual experiences from a trauma of that magnitude are felt physically, psychologically, emotionally and spiritually. People grieve in very different ways, and when the cards and flowers stop coming and the condolences trickle off, a couple is left to sit with their grief, despair and emptiness while the rest of the world 'gets back to normal.' Six weeks after I handed my dead daughter over to a nurse, I found myself walking on to the stage at Madison Square Garden to 'entertain' people. I was by no means ready to re-enter that world, but the music industry is vicious and unforgiving… and somehow, there I was. For me, 'grieving' took the form of a rapid and immediate free fall into an abyss of drug addiction. While I don't defend my response as appropriate (and I certainly wouldn't recommend it), I do very clearly understand how it happened. And I do forgive myself. "One doesn't 'heal' from the loss of a child. You don't ever 'get over it,' but time passes. New experiences put a sort of distance between what is now and what was then. Still, the trauma of child loss leaves deep scars. Wounded people isolate themselves for protection. People in pain lash out in fear. Resentments and regrets fester. It becomes seemingly impossible to navigate a conflict that has an endless array of wrong answers but no apparent right ones. People you expected to be there for you disappear. People you barely even know hold you up. Relationships strain and crack under this type of pressure. Grief changes people. A year after Madalyn died, my wife and I were blessed with a healthy, living baby girl. She is the light of both of our lives. A light to find our way. "Not too long ago, I sat playing guitar on a barstool in my kitchen and within about 15 minutes came up with the outline of the music that would become the song 'Embers'. Nearly a decade after 'Walk With Me In Hell', it was happening yet again. Art was imitating life. Knowing intuitively that this would be a special piece, I once again began scribbling lyrics to my wife. I described our shared pain and made references to places and events that only she would understand and recognize. I promised her that there was 'still light to find our way.' I hoped I was right. "I didn't write all of the lyrics to 'Embers'. Randy Blythe wrote the words to the outro section that Chino Moreno sings so beautifully (those words and that performance are absolutely magical), but the verses and choruses that I did write reflect my experience living in the aftermath of a child's death. "For me, 'Embers' is a song about hope. It's about hanging on to that last shred of light in your life and not giving up on it. It's about believing that love can overcome despair. Most of all, it's about forgiving yourself."